i like new love for nerds, but this is insane... is it less redicolous then it looks on paper in real play? "and you can target her after her story resolves getting her additional I struggle at 2 stories during one phase..."
You still need to pick a character capable of committing. If you're saying that you can wait until she's been refreshed from winning Arcane and use her again with another Expert Testimony, that doesn't work. It's a good card, but you're describing a combo of at least 4 cards. Whitton Greene + Overworked Graduate Student + Expert Testimony + something to bring Expert Testimony back. Of course a hand-picked combo of that many cards is good, but it's hell to get all the cards together and keep them together in a real game AND do it all in time to matter. it makes really nice event recycling loop, especialy as both cards alone are still usefull - atlantis for controlling opponents discard recursion. I tried to build rush mono MU with this card, but didnt play it yet so I dont know how strong it is, anyone played with it? From a rules answer of FFG: Expert Testimony may commit an already exhausted character. It may also commit an already committed character, but only to another story. In that case, the character is uncommitted from the old one and committed to the new story. 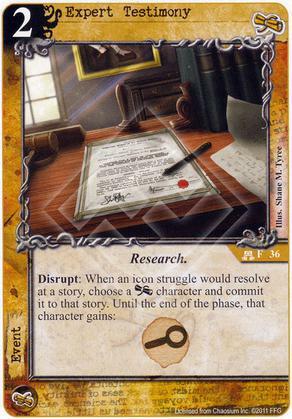 So this allows a character to do double-duty at stories and gives them a investigation icon for the trouble. Very nice card. Slightly overpowered, I think. Well, that bumps it up a notch. Maybe it's time to build another MU deck and try it out. And if my opponent plays MU I can use it to drag his guys to their deaths just as well as shuffle mine around since it doesn't say "that you control". Can I attach Expert Testimony to an Opponent's MU character, and if so on whose side of the story does the character commit? I believe you can choose an opponent's MU character, and it will gain the Investigation icon booster. However, the character remains under your opponent's control, so you would rarely want to use Expert Testimony in this way. Maybe if you were trying to create an opening at a second story, and this first story was just meant to be a diversion. That would be a pretty cagey move. This is such a versatile card though, I'd almost always play it conventionally because there are so many ways you can use from it. Just a small point on semantics: you don't actually attach Expert Testimony to a character. You choose the character, then Expert Testimony goes to the discard pile. You only attach a card when it specifically says "attach" (see Tear Gas, for example). Yes I meant "apply" Expert Testimony to an opponents MU character,. not attach. My main motives for doing so, if character commits to opponent's side of story rather than mine, would be not only removing charcater as defender at first story but also either to gain second (I) struggle at a story i was going to win (I) at even with the added MU charceter on oppent's side; or to bring the the opponent's character into a lost (T) or © struggle. In this context, it is acting like a high-cost MU-target-limited Mists of Lethe. This card synergises very well with Professor William Webb, BTW..